ABSTRACT – The molluscan fauna of the late Eocene Pallinup Formation from the southern coast of Western Australia consists of 30 species of bivalves, 125 gastropods, 1 scaphopod and 1 cephalopod. Of the gastropods, 29 are newly described, 13 have been previously described from the formation, 32 have been previously described from other localities and are here newly recorded from the formation and the rest are recorded in open nomenclature. The majority of the gastropods are carnivores that preyed on or were associated with sponges, cnidarians and tunicates. Tenagodus occlusus Tenison Woods is a very common gastropod, often found preserved within silicious sponges. 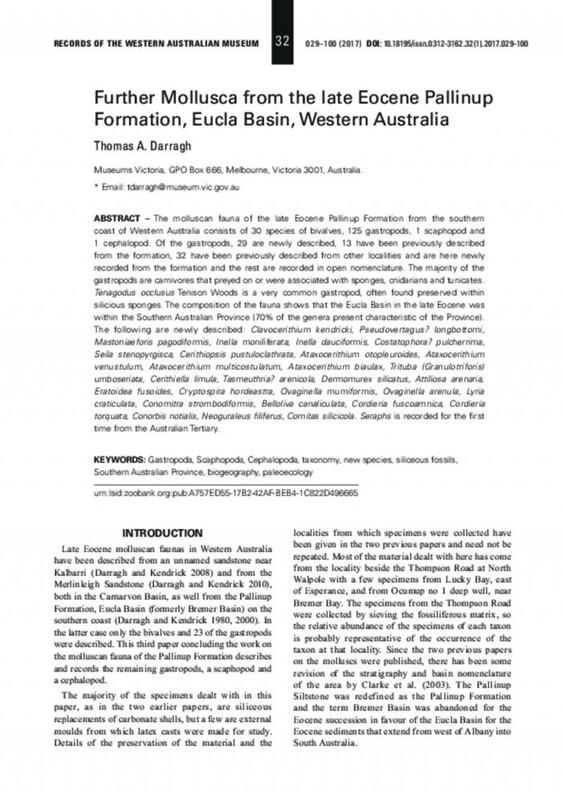 The composition of the fauna shows that the Eucla Basin in the late Eocene was within the Southern Australian Province (70% of the genera present characteristic of the Province). The following are newly described: Clavocerithium kendricki, Pseudovertagus? longbottomi, Mastoniaeforis pagodiformis, Inella moniliferata, Inella dauciformis, Costatophora? pulcherrima, Seila stenopyrgisca, Cerithiopsis pustuloclathrata, Ataxocerithium otopleuroides, Ataxocerithium venustulum, Ataxocerithium multicostulatum, Ataxocerithium biaulax, Trituba (Granulotriforis) umboseriata, Cerithiella limula, Tasmeuthria? arenicola, Dermomurex silicatus, Attiliosa arenaria, Eratoidea fusoides, Cryptospira hordeastra, Ovaginella mumiformis, Ovaginella arenula, Lyria craticulata, Conomitra strombodiformis, Belloliva canaliculata, Cordieria fuscoamnica, Cordieria torquata, Conorbis notialis, Neoguraleus filiferus, Comitas silicicola. Seraphs is recorded for the first time from the Australian Tertiary.